"Pre-lit design that works perfectly for indoor or outdoor displays." "Made from 320 artificial leaves and is embellished with outdoor elements." "Bound to be a wonderful addition to any home." "Looks just as lovely on your porch as it does above your fireplace." "Will last many years so you can customize depending on your mood." "A great choice for those who don’t have the time to decorate it." "For those who love the fall season and want to keep the feeling." "Will instantly transform your space into a winter wonderland." "Holiday guests will be tricked into thinking this artificial wreath is real." This wreath has an attractive, pre-lit design that works perfectly for indoor or outdoor displays, making it an all-around favorite. While this wreath is one of the most affordable ones on our list, it doesn’t compromise quality. Each Crestwood Spruce Wreath comes trimmed with red berries, pinescones, and glitter, so you won’t have to invest extra effort in the decorating to make it match your holiday decor. Customers rave about how good the garland looks on your door, wall, or window for the entire duration of the season. According to them, “it looks good just about anywhere.” However, they do note this wreath does need to be plugged into an electrical outlet, so be sure to fit that into your display plans. If you prefer an artificial pick, here’s the best one of its kind. This all-season wreath is made from 320 artificial leaves and is embellished with outdoor elements to make it look just like the real thing! It can be hung both indoors or out, and looks good above a mantle, in your entryway, or, in the most attention grabbing places of them all—the front door! Measuring 15 inches in diameter, it’s covered in an ultraviolet resistant plastic and backed up by a durable iron frame, so you can almost guarantee it will stay green for years with little maintenance involved. Which, TBH, is the main reason we love this option. For those who love the look and feel of a REAL holiday garland, here’s another buy that boasts rave reviews from customers. The Garden Boxwood Wreath has the classic design of the accent you grew up with. However, it has been preserved and dyed with synthetic ingredients to make it last much longer than you’re used to—which is something we definitely won’t complain about! With a traditional look, it’s bound to be a wonderful addition to any home, impressing guests every time they step through the door. Although there are many wonderful things to be said, the reviews do recommend keeping it in direct sunlight and watered to maintain its natural integrity for days to come. Vivid, stunning, and bursting with color and light, the Tartan Plaid Wreath from Andover Mills looks just as lovely on your porch as it does above your fireplace, above a window, or virtually anywhere in your home. In fact, several reviewers said that they purchased more than one at a time to use for decorating their home! Boasting pretty tartan cloth poinsettia flowers, snow-frosted pinecones, and clusters of cherry-red berries, this wreath is also strung up with 50 long-lasting LED lights that exude a warm, natural glow. The Tartan Plaid Wreath is non-allergenic, fire-resistant, and energy efficient. Sometimes you want to be a bit more festive and bold, and by hanging a tinsel wreath you'll do just that. This 17" wreath comes in four different colorways, including gold, silver, red and green so you can choose which hue suits your personality more. Hang it by itself or add some metallic ball ornaments for some more color, this wreath will last you many years so you can customize differently depending on your mood. If you’re in the market for an investment wreath with excellent lighting, the artificial National Tree Company Wintry Pine Wreath should be your top pick. It comes covered in pre-strung, low voltage, soft LED lights, for a glow that looks good both indoors and out. A self-timer is also included, making it easy to program your lighting based on your travel schedule or decorative needs. This wreath is trimmed with pine cones, red berries, and snowflakes, making it a great choice for those who don’t have the time—or energy—to decorate it. It’s also battery operated, so no cord is needed. Most users say the wreath is long-lasting and durable enough to use across a variety of climates. However, they do note that the batteries need to be changed out frequently to keep it lit. While greenery is nice, sometimes you want to go even more earthy. A pinecone wreath is a great option for those who love the fall season and want to keep the feeling up through Christmas. With pinecones being more of a seasonal item, this option will work October through December. The addition of berries gives this rustic 20" wreath a nice pop of color. Hang this on your front door or above your sideboard for an unexpected wall decoration. If you are dreaming of a white Christmas, this elegant white wreath will instantly transform your space into a winter wonderland. 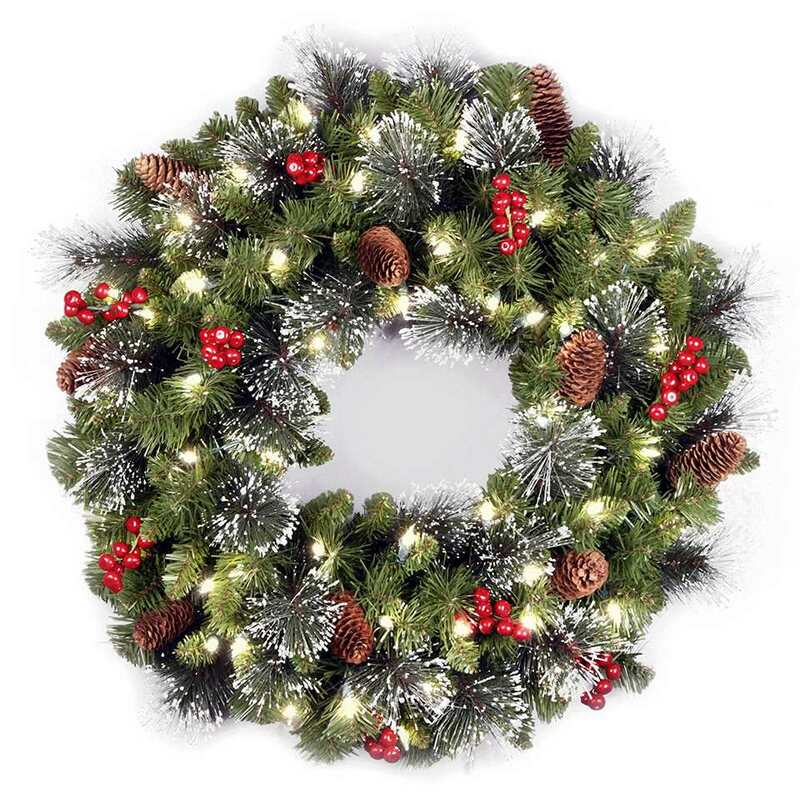 This 30" pre-lit holiday wreath is adorned with 50 white LED lights that emit a soft glow. Hang it above your mantel or on your front door (it's indoor and outdoor), as the durable metal frame is easy to mount. You also have the option to hang ornaments on the branches for a truly unique look, or you can leave it as is for a monochromatic piece. This decoration comes with extra bulbs and fuses. For those who can't get enough of poinsettias, the official plant of Christmas, add this gorgeous pine and poinsettia wreath to your holiday display. It measures 30" in diameter, and it comes pre-decorated with vibrant poinsettias, berries, pinecones, and ornaments. The lightweight PVC material makes it easy to hang above the mantel or on your front door. The best part? The red poinsettias look and feel like the real thing, so holiday guests will be tricked into thinking this artificial wreath is the real deal!